What role do universities play in regional development? How university roles in ‘periphery’ differ from university roles in ‘the core’? What are similarities and differences between universities in Northern and Central Europe? 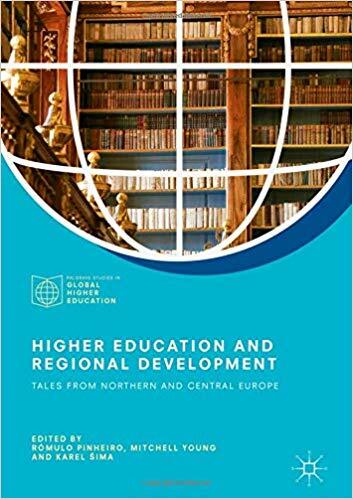 These are some of the questions addressed in a new book Higher Education and Regional Development: Tales from Northern and Central Europe edited by Rómulo Pinheiro, Mitchell Young and Karel Šima. Learn more about their book in this Q&A with the editors. Q1: What have been the rationales and origins of this book? The book is the result of a 2-year comparative project ‘PERIF: Higher Education in the Socio-Economic Development of Peripheral Regions’ funded by the Norwegian Research Council under the Norway Grants program, focusing on the socio-economic impact of universities in peripheral regions in Norway and the Czech Republic. Q2: In research policy and higher education studies there have been a long-standing focus on the socio-economic role of universities and their contribution to regional development. What is novel angle and contribution of your book to this area? Most existing studies tend to adopt a single case research design and, in those cases where more than one case is used, they tend to focus on a specific national setting. We also found that the notion of ‘peripherality’ was ill developed and underexplored, both conceptually and empirically. Finally, a great number of studies approaches either the case ‘region’ or ‘the university’ as a black-box, thus taking for granted a series of determining variables. The ambition of this study was to undertake a cross-national comparative analysis of the key factors – internal and external to universities and regions – that can account for the observed outcomes. That said, our remit was not to undertake an impact or assessment study – focusing on cause and effects – per se; but, rather, shed light on the interplay between important elements such as policy, university leadership, academic norms, regional culture, etc. Q3: Your book compares Norway and Czech Republic. Why these two countries were chosen? What are similarities and differences between Norway and Czech Republic? What can they learn from each other? They represent two distinct economies with different political and administrative traditions and historical trajectories and at first glance are something of a least-likely comparison. Norway represents the so-called ‘Nordic model’ and its long tradition of pluralistic political representation as well as large investments in education for all. Historically, regional development policy and higher education policy have tended to converge. As for the Czech Republic it represents what is called by some authors a dependent market economy, which is now highly tied to Europe, particularly Germany, but with a weaker social net and stronger neoliberal tendencies. Historically the country has transitioned out of communism, but it has also a legacy of ethnic tensions, especially in peripheral regions, during the 20th century. Yet, at the same time, both countries are of similar population size and somewhat peripheral to both globalization and the European Union project, with Norway being a ‘quasi-EU member state’, and both face critical regional economic asymmetries. In the end, the number of similarities we found between the two countries was somewhat surprising. Certain ‘types’ of peripheral regions exist in both countries, and while there are significant differences of national context, we think that learning from them can go both ways. Q4: Your book uses the concept of periphery. How do you define ‘periphery’? How the role of universities in ‘periphery’ differs from their role in ‘the center’? There are a number of dimensions in this respect; a spatial dimension, a cultural dimension, a political/power dimension, an economic dimension, etc. (which is developed in some detail in the volume’s introduction). Simply stated, by ‘periphery’ one refers to locations that are outside the mainstream when it comes to attracting and retaining talented individuals and jobs, across the public and private sectors. Obviously, one can also find ‘centers’ within the periphery as well, and these tend to be the areas where universities are located and where its impacts are most immediately felt. To sum up, the ‘periphery’ is clearly relational concept and its definition depends on context. 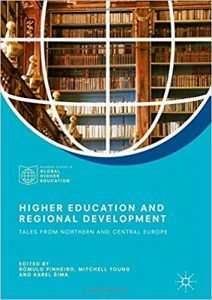 We would argue that the role of universities in peripheral regions, as I think the book demonstrates, looks different from that of those in the center. It’s an important question, and we felt that there was a gap in the literature there. Much of what’s been written focuses on central regions, or successful regions, but the cases in this book look at regions that have struggled a bit. There’s a bit of a simplification in thinking that a university can just itself pull a region into the competitive knowledge economy. Success in that requires both regional and university initiatives to dovetail. Q5: To highlight the role of universities in socio-economic development, some researchers and policy-makers use the concept of the third mission highlighting that in addition to two traditional missions of teaching and research universities also have broader social and economic roles. Does your research find the concept of the third mission relevant and how? Indeed, the entire premise of the project was the notion that universities located in peripheral localities have an obligation, formally (mandate in policy) and/or morally (as good citizens), to contribute to the development of their surrounding regions. Traditionally, the third mission has been structurally decoupled from the core functions of teaching and research. Yet, in recent years several studies point to the importance of articulated strategic frameworks in which regional dimensions ought to be embedded into the core tasks of universities, rather than being seen as a ‘third leg’ or something that is nice to have. Our findings suggest that most case universities fulfill their regional mission through the provision of skills to the region (teaching function) rather than knowledge transfers (research) in the classic sense. This, however, creates significant limitations when it comes to fostering regional absorptive capacity and ensuring regional resilience in the long run. The lack of research capacity, a distinctive feature of most universities located in peripheral locations, implies that their ability to support the region is limited, particularly within the context of a globally competitive knowledge-based economy. Q6: What are the main lessons from your book for practitioners and policy-makers? Q7: What would be interesting avenues for future research? There is a lack of longitudinal studies, following particular universities and regions over a considerable period of time, say a decade or more. We’d also say that a better understanding of how regional-university interfaces are established and how those policy processes work. Studies which integrate and attempt to articulate both the regional and higher education fields would be valuable; as we said earlier, both have for the most part treated the other as a black box. Rómulo Pinheiro is Professor of Public Policy and Administration at the University of Agder (UiA), Norway, where he co-heads the research group on Public Governance and Leadership (GOLEP). Rómulo’s research interests are located at the intersection of public policy and administration, organisational theory, economic geography, innovation and higher education studies. Mitchell Young is Assistant Professor of European Studies at Charles University. His research interests are in the public policy and institutional context of research, knowledge, and innovation, as well as the effects of policy tools on the micro-level behaviours of researchers and organizations. He is a co-convenor of the ECPR Standing Group Knowledge Politics and Policies. Karel Šima is Assistant Professor at the Department of Ethnology, Charles University. He worked in higher education research at Centre for higher education studies in Prague for ten years and took part on numerous national and international projects. His main research interests are research-teaching nexus, Humboldtian model of university, Czech higher education and science policy in general and research evaluation specifically. This entry was posted in Education, Politics & Public Policy, Publications & Events, Science & Technology, Teaching & Learning, The EU and tagged higher education, innovation policy, knowledge economy, regional development, regional innovation systems, research policy, universities. Bookmark the permalink.